Cost of construction max: The building costs of the project are slightly less expensive than comparable buildings due to the size of the project, a cost framework from the beginning and a strategy on cost effective construction. But the main difference is the non-profit principle of the cooperative which makes the difference that leads to low rents. Rental/sale cost compared to market price: Due to the cost-rent calculation, the average costs for apartments are 20–30% less than market values for comparable apartments. 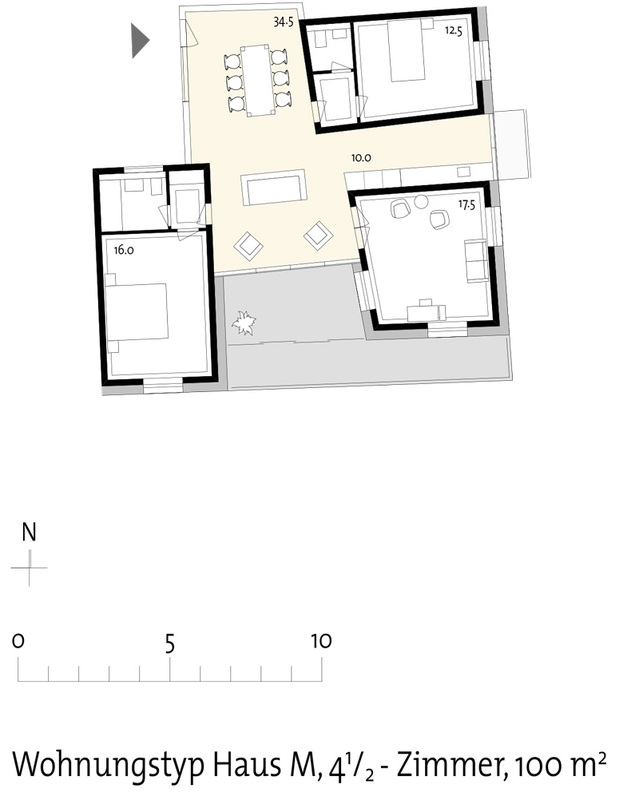 A 4-room apartment costs less than CHF 2000 a month, whereby the average on the market are CHF 2500–3000, based on the statistical study published by the City of Zurich. Rules of allocation: Although the rents are low, additionally, 20% of all apartments are subsidized for people living on the breadline. Rules for renting include minimum occupancy, participation and community engagement, ecological standards, sharing economy principles and diversity. Protection of fragile categories: A centerpiece of the project is social and cultural diversity. In addition to the 20% subsidized apartments another 10% of all apartments are reserved for charity and non-profit foundations supporting handicapped people, immigrants, students and children under child-welfare. Involvement of inhabitants in the building process: People from the founding cooperatives have been involved in the process. 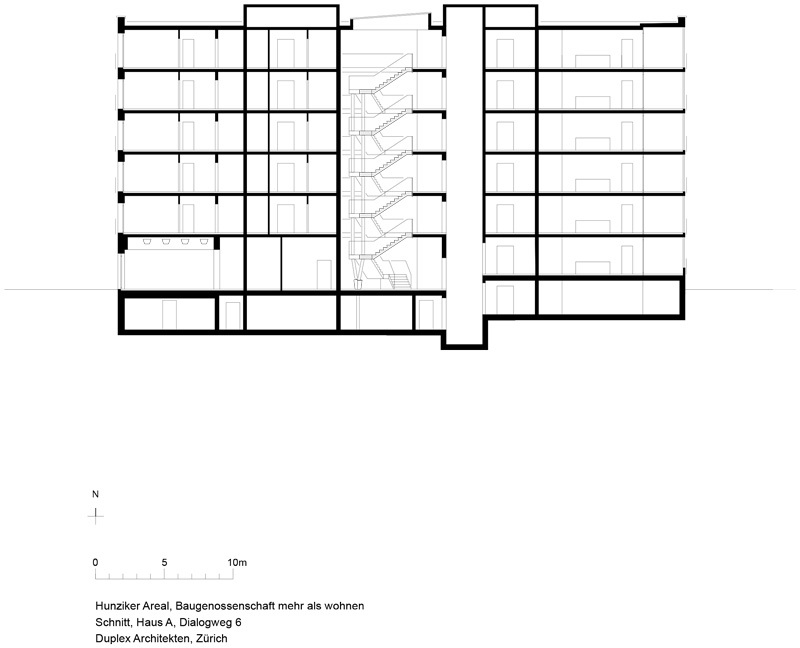 It started with the architectural competition, which resulted in ‘echo chambers’ (workshops), where future residents, neighbours, the founding cooperatives and city government representatives participated. Community accompaniment in the life of the building: All tenants are invited to play an active role in shaping the community. Common spaces and an annual budget of CHF 80000 from the solidarity fund are at the tenants’ disposal for community initiatives, such as cooperative-contract-farming, grocery shop, repair café, swapping place, dancing, playing or practicing yoga together, offerings for children, common gardens, German teaching group, co-working space and more. 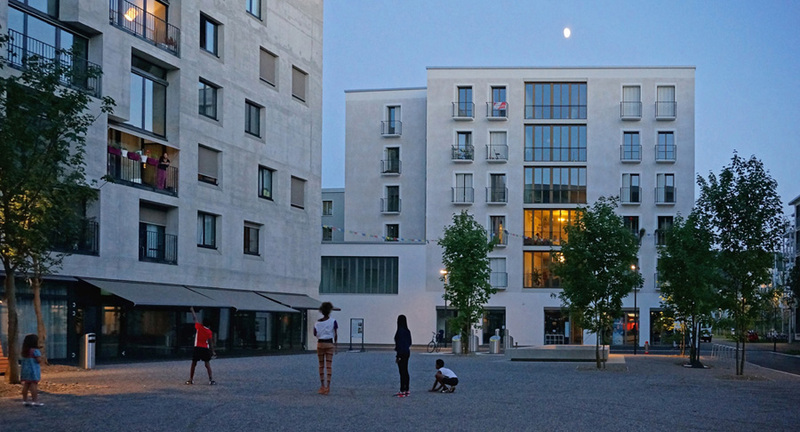 Functional mixitè: mehr als wohnen took the opportunity to transform a waste-land into a lively urban space. This transformation was only possible by applying the principle to build an urban quarter. 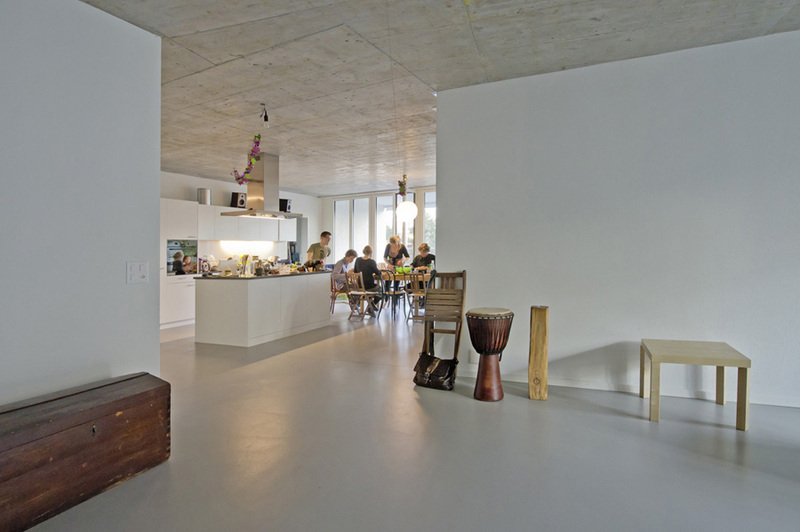 All ground floors have public uses as local supply, shops, service providers, cultural spaces childcare or common rooms. 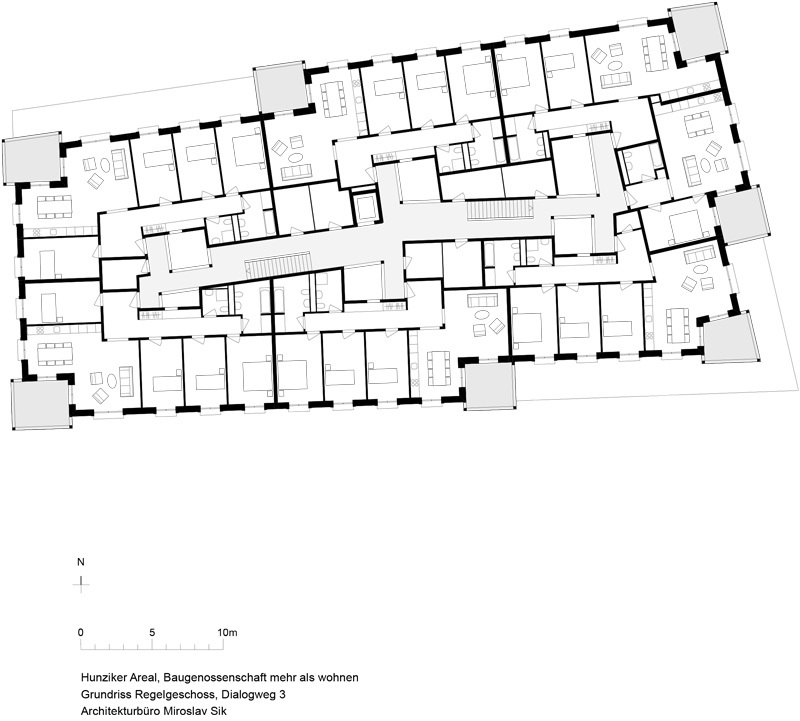 Common spaces and shared living: 10 non-commercial common spaces are available for all inhabitants. Their usage was defined by the inhabitants and most are are open to the public. For some initiatives we partner with public organisations e.g. in youth work or support for elderly people. Techniques and strategies for environmental saving: The project follows a low energy/low tech approach and is a certified 2000-watt-area. 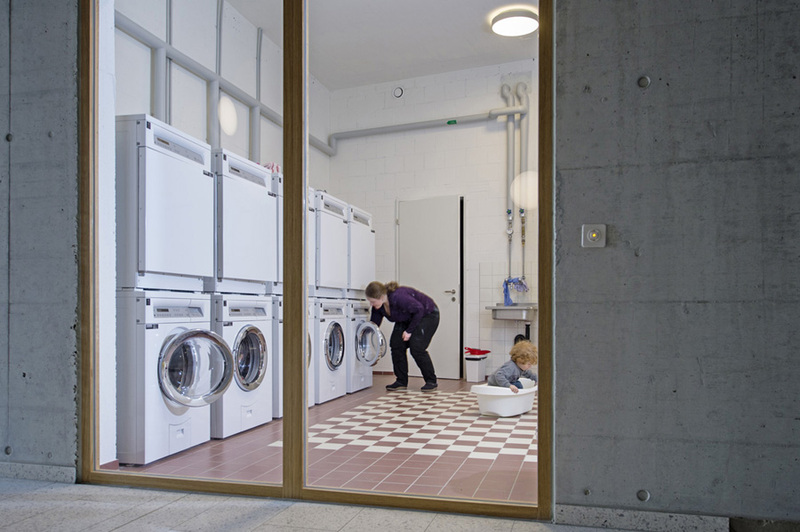 We built long lasting buildings with sustainable materials, have technical innovations combined with social sustainability like shared rooms for laundry or central freezers. we have a strict mobility concept which makes the site nearly car-free, we are a power plant: 45% of the required electricity is produced by photovoltaics on all roofs, we reduce floor space consumption. 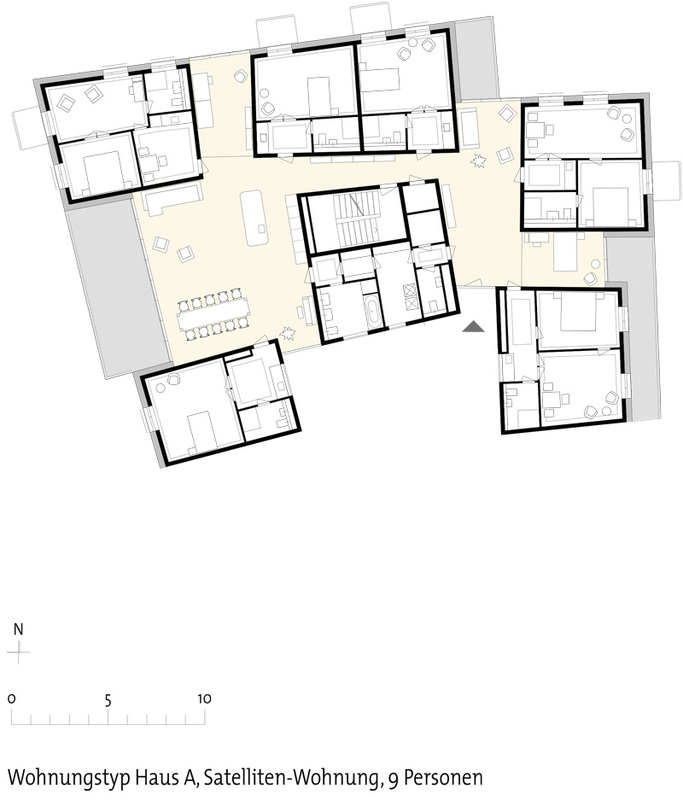 mehr als wohnen is a Swiss non-profit housing cooperative based in Zurich, Switzerland. 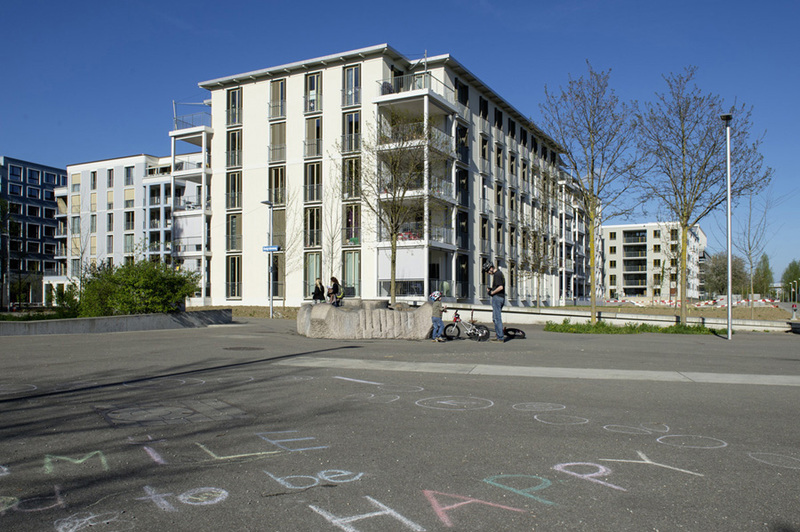 About 50 housing cooperatives of Zurich founded mehr als wohnen in 2007, celebrating the centenary of nonprofit housing in the city of Zurich. With the vision of the centenary slogan “100 years of more than housing”, the aim was to realize an innovative new quarter for the benefit of the nonprofit housing sector. 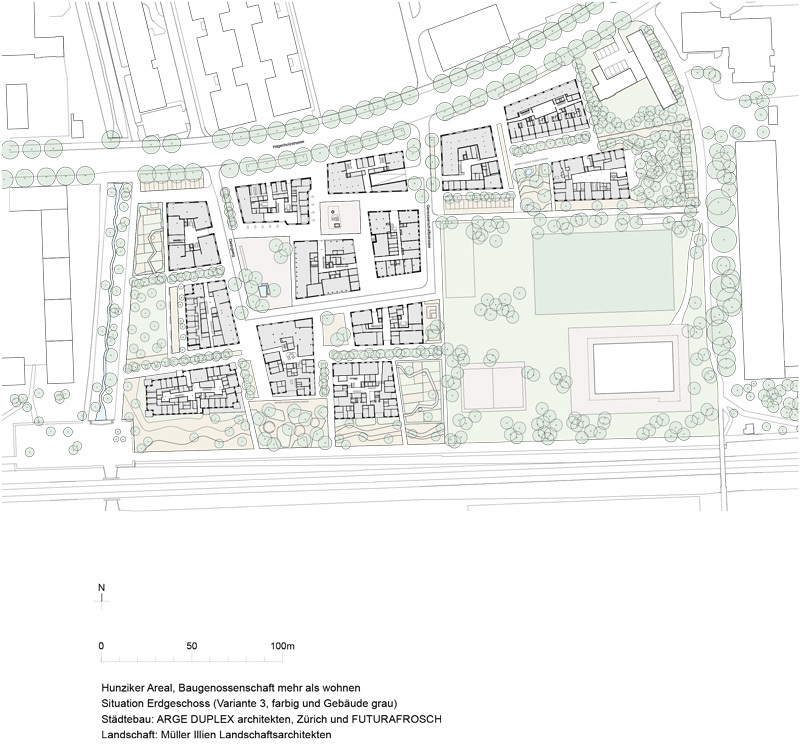 The Hunziker Areal is the first project and situated in the Northern part of Zurich, a metropolitan region between the old city center and the Zurich airport, that is growing fast. 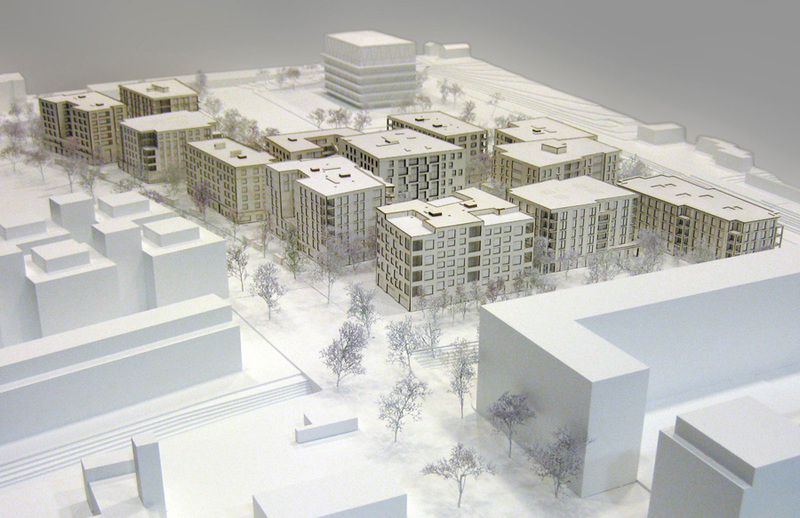 Mehr als wohnen leases the land from the city of Zurich. With the innovation hub the newly founded cooperative took the chance to transform the waste-land-area into an urban zone. This transformation was possible by applying the principle to build a quarter, not a housing estate, and by spreading the risks by uniting the long-established cooperatives (which are the founding members). The project is facing the pressing task of building and living, according to energy and resource-efficient means that go far beyond familiar energy labels. It provides affordable housing in a restrained market based on participation, basic democratic structures, providing an ecological and social sustainable framework, where innovation, self-organization and the 2000-watt-society are being supported. 13 houses with nearly 400 housing units, 35 retail units and ten shared community spaces were completed between autumn 2014 and summer 2015. 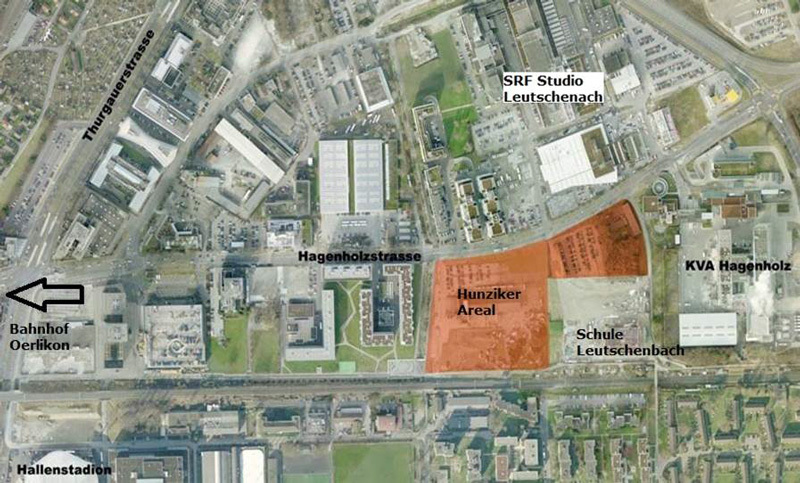 Since then, 1200 occupants and 150 employees live and work at the Hunziker Areal. 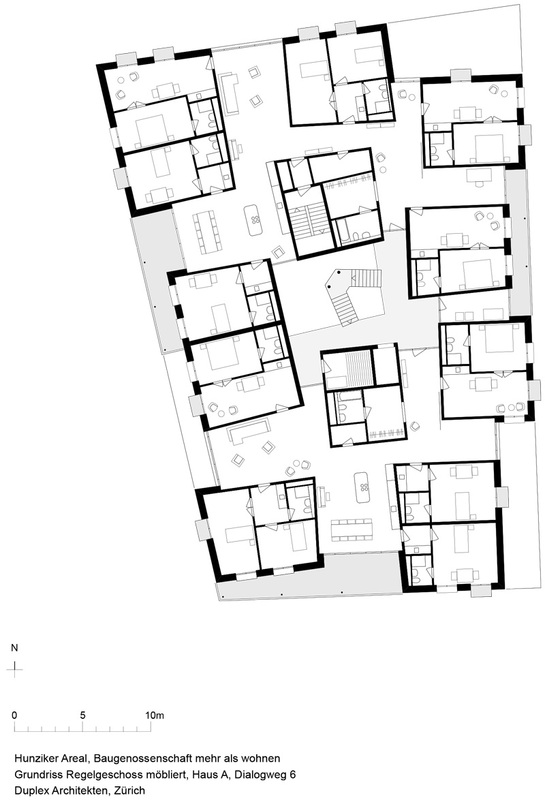 The social mix among the inhabitants underpins social cohesion, various types of apartments varying from small studios to familiy and large shared apartments enables different models of living together. The cooperative is not only responsible for the infrastructure but also for conducting research on the innovations implemented and to share the gained knowledge with its members and the housing sector. Evaluation bases on three main categories: ecology, sociology and economy and is being led by the cooperative’s head of research & innovation. 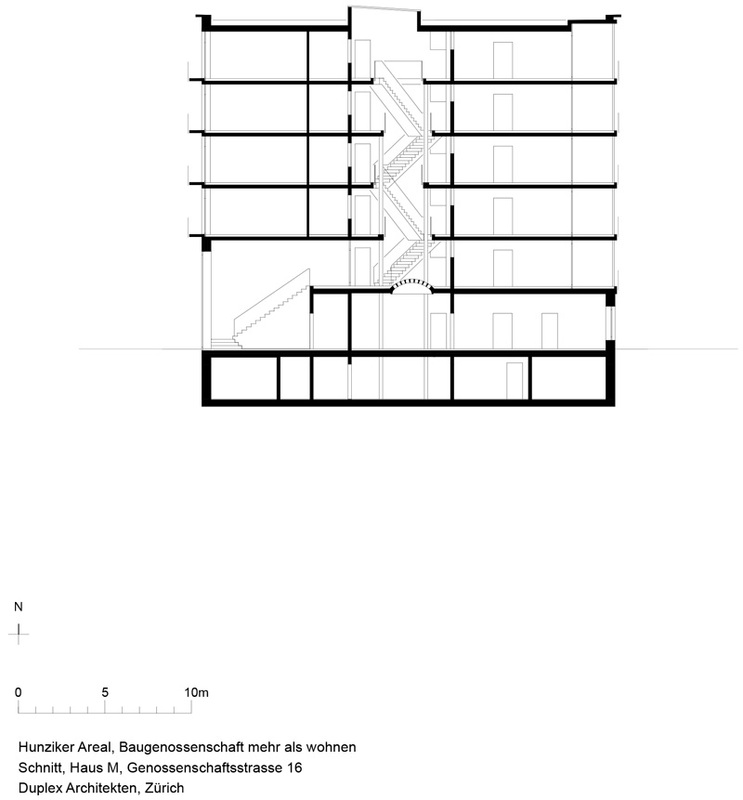 Participation is at the core of everything that mehr als wohnen does. Being member of a housing cooperative means having equal rights and duties to all other members based on direct democratic structures. Low rents based on the costs are guaranteed long-term and all important decisions are taken jointly by the cooperative members.